On the occassion of the 10th anniversary of the ENCJ, a guide to the ENCJ was published. 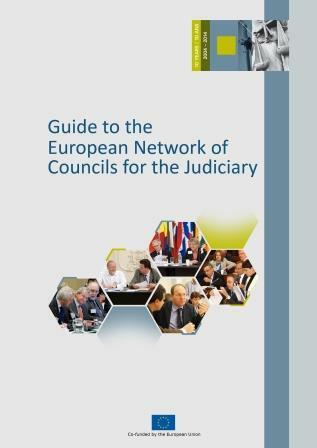 The guide contains information on the functioning of the ENCJ, the various models of Councils for the Judiciary in Europe, the various ENCJ declarations and detailed information on the compostion and functioning of the member Councils for the Judiciary of ENCJ. The Guide will be regularly updated. In November 2002, a small group of relatively young Councils for the Judiciary took the initiative to invite their colleagues from similar organisations in the European Union to participate in a conference for Councils for the Judiciary. The objective was to get acquainted with each other's systems and organisations, to exchange information, to learn about each other's accomplishments (and mistakes) and to assess the possibilities for co-operation in various fields. Moreover, there was a common understanding that as the European Union is developing, so is the role of judges, both as national judges and as judges in and of the European Union. More obligations and duties are being placed on the judiciary. Consequently, there is a need for more judicial co-operation. This necessitates a good understanding by members of the judiciary of the legal and judicial systems in other Member States. The European Network of Councils for the Judiciary (ENCJ) was formally established in 2004 at the General Assembly in Rome. It consists of national institutions in the member states of the European Union which are independent of the executive and legislature, and which are responsible for the support of the Judiciaries in the independent delivery of justice. The Council for the Judiciary organisations are in various ways responsible for the support of the judiciary in the independent delivery of justice. Characteristic for all organisations is their autonomy and their independence of the executive and legislative power. Although no two Councils are alike they are all in charge of monitoring and promotion of the judiciary. Some Councils (traditionally referred to as the Northern European model) have competencies that include policy and managerial tasks, budget and budgeting procedures, whereas other Councils (also known as the Southern European model) are competent with regard to career decisions for judges, recruitment and training and disciplinary actions. The Ministry of Justice, in member states where institutions as specified above do not exist, may be granted observer status. Councils for the Judiciary from European Union candidate states may also be granted observer status. The ENCJ Statutes were adoped in November 2007 in The Hague. Since December 2007, the ENCJ has been recognized as a not-for-profit international association in accordance with the Belgian law. With the financial support of the European Commission, the ENCJ opened a Permanent Office in Brussels.